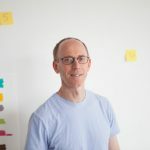 Spencer Finch works in a variety of media, including painting, photography, sculpture, and installation. Often recreating the experience of natural phenomena through artificial constructions, Finch’s work raises questions about perception, memory, experience, and time. The artist is known for his light-based installations, including Cloud (H2O), 2006, on view in the Hirshhorn’s 40th anniversary exhibition At the Hub of Things: New Views of the Collection. Mimicking the molecular structure of water through an arrangement of suspended light bulbs, the sculpture is a glowing representation of water vapor that hovers between representation and abstraction. Join us as Finch speaks about his work as part of the Museum’s ongoing Meet the Artist series. At the Hub of Things: New Views of the Collection is organized by curator Evelyn Hankins and associate curator Melissa Ho. The exhibition is made possible in part by support from the Estate of Frank B. Gettings in memory of Nancy Kirkpatrick and Frank Gettings, the Holenia Trust, and members of the Hirshhorn Annual Circle Program.